[Review. The Leeds Times, Feburary 20th, 1847]. Stocking stitch on both sides! As Christmas is coming and one of my sons requested a scarf with a ‘Ravenclaw’ theme, I picked up the needles to do that most dreaded of things: a scarf. To make the whole thing vaguely more interesting – insofaras any scarf knitting can be made interesting – I decided to choose and knit a genuine Victorian knitting pattern, or ‘receipt’. And to get even more bang for my buck, decided I’d learn a new (t0 me) technique. So, a double knitted Victorian scarf it was, then! I ignored Cornelia Mee’s far more tasteful original colour suggestions and went with what I’m told are Ravenclaw colours. 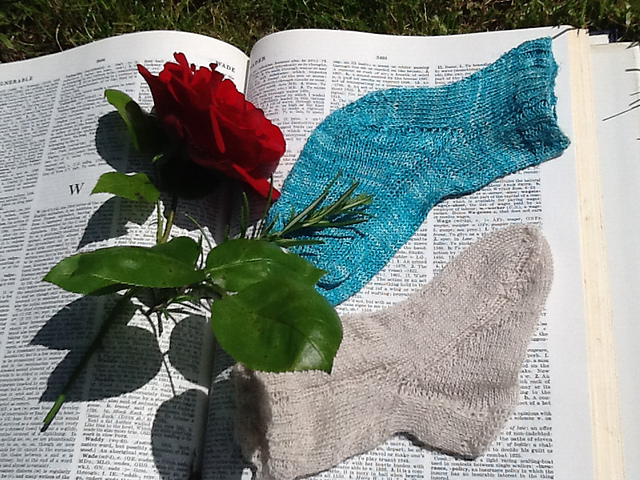 I’d already knitted a ‘Child’s Sock’ from Cornelia Mee and Miss Austin’s ‘First Series of The Knitter’s Companion’. The scarf I knitted was “For a Comforter” from Cornelia Mee and Mary Austin’s ‘Exercises In Knitting’ (1847 edition). Cornelia Mee was born at High St, Bath, Somerset on the 23rd of April, 1815; daughter of Thomas and Sarah Austin, nee Shoobert. According to Jane Sowerby in “Victorian Lace Today“, Cornelia’s father, Thomas Austin, was “a haberdasher. bookseller and undertaker”. Her mother’s maiden name may hint at the reason Cornelia got into the Berlin wool trade, although Sarah Shoobert was born in Hackney, around 1788, her grandfather came from Sachsen, Germany. It’s unclear whether Cornelia’s grandfather, John Conrad Schubert, was born in Germany or the UK, but he married in London in 1772 and his daughter Sarah was born in Hackney. Cornelia’s parents lived in Bath. But the fact Cornelia’s death was registered in Hackney suggests they may have kept property there, despite living in Bath and later Mayfair, London. Her sister, Mary Austin was born in 1826, also in Bath. Cornelia had at least four older siblings, and three younger. Cornelia and Mary’s mother died in 1829 when Mary was only 3. Their father, Thomas, died the following year. Cornelia was 15. Cornelia seems to have continued her father’s shop, as a few months after her marriage, the Bath shop was still being advertised as “Austin’s Berlin Wool, French Silk and Embroidery Rooms”. It subsequently changed its name to “Mee’s”. Cornelia married Charles Mee, originally from Mathon, Worcestershire, in December 1837, in Bath. Cornelia and Mary were to live together for decades; Mary’s life taking the familiar route for many an unmarried nineteenth century younger sister; living with an older sister, brother-in-law and their family. Although she must have paid her way; working as a shop assistant, Berlin wool worker and later, as co-writer, with Cornelia. By the late 1830s, Cornelia appears to have been in business running an embroidery company with Henry Faudel and Benjamin Phillips, as the partnership was dissolved – or rather, Cornelia took sole ownership of it, in January 1838. (The London Gazette, January 2nd, 1838). Faudel must have been close, as Cornelia’s eldest surviving daughter was named “Mary Faudel Mee”. In February 1839, Cornelia advertised that Austin’s Berlin wool warehouse was now in her sole control. Although now, we think of the mid 19thC knitting manuals written by ‘Cornelia Mee’, she co-wrote her later books with her younger sister, Mary (“Miss Austin” born 1829), who for some reason, now seems largely forgotten. There were other sisterly duos co-writing knitting manuals in the nineteenth century; notably Elizabeth and Henrietta Ryder, in Richmond, Yorkshire. It seems the fate of the sister whose name is second on the book’s cover, is to be forgotten by history as the books seem to usually be described as “Cornelia Mee’s” when the ones with considerable knitting content were written by Cornelia and Mary. Cornelia and Mary’s patterns have been knitted up by some intrepid knitters (Search the ‘Patterns’ tab on ravelry.com). They look to be sophisticated and well executed designs. Cornelia and Mary’s “A Knitted Veil in Pyrenees wool” can be found on p.68ff of Jane Sowerby’s “Victorian Lace Today”, written in a way that makes it clear for contemporary knitters. In 1841, Cornelia and Charles had a “German Wool Warehouse” on Milsom St, Bath. Like the Jacksons of York, their Berlin Wool Warehouse seems to have started with embroidery as its mainstay and then expanded into crochet and knitting, as these crafts grew in popularity amongst the middle classes in the 1840s. Crochet and knitting manuals seem to have come about in the late 1830s; partly as a response to the new availability of Berlin wool, in the UK. Most of the early knitting manual writers – women like Jane Gaugain, Elizabeth Jackson and Cornelia herself, ran Berlin Wool Warehouses, so there is a sense that the manuals came about partly as shrewd marketing for the yarn. Early manuals mention both Berlin and English wools – the Berlin often being a fine merino; the British from a sort of Leicester sheep. Cornelia and Mary’s books were full of fairly everyday knitting; useful items, on the whole – not so much of the penny jugs or Victorian fol-de-rols. Although there are receipts (patterns) for lace, as well as workaday scarfs, wrist-warmers, and baby clothes. Cornelia published “Manual of Knitting Netting and Crochet Work” in 1842. She wasn’t the first woman to publish a ‘work table’ book – but she was one of the pioneers of the publishing phenomenon. (She had already published a magazine of decorative ‘church needlework’ so her work wasn’t entirely secular. Cornelia won no prizes but an honourable mention at the Great Exhibition for “screens, and flags of all nations”, implying that embroidery was still the staple craft of her shop. “Screens” would refer to embroidered fire screens; possibly an earlier use of the colourful Berlin wool – knitting and crochet seem to have taken off after shops like the Mees’ and the Jacksons’ ewere firmly ensconced as embroiderers. The Mees moved to 229, Regent Street and were recorded there in 1858. It’s possible their Berlin wool warehouses were now a chain of shops, maybe in Bath and London; possibly further afield but I have yet to find advertisements to back up this supposition. On census night in 1861, Cornelia was visiting the family of Henry Fisher, a timber merchant at the imposing 15 Rodney St, Liverpool. Cornelia didn’t give an occupation for herself. It appears she had some Liverpool connections, as her daughter, Mary Faudel Mee, was to die there, in 1870. Meanwhile, Charles Mee was now in London, at the prestigious address of 71 Brook St, and described himself as “Traveller/wine, hops, wool, needlework”. Sister Mary was listed as “Berlin wool worker” along with an employee, Annie McQueen, a 25 year old from Edinburgh. This is very suggestive of the excellence of ‘Berlin wool work’ in Scotland, and Annie McQueen can have been no stranger to the legacy of Scottish knitting manual writer, and Berlin wool warehouse owner, Jane Gaugain. (We also found an Edinburgh connection with one York Berlin wool warehouse). The whole story hints at the pan-European nature of the Berlin wool trade. 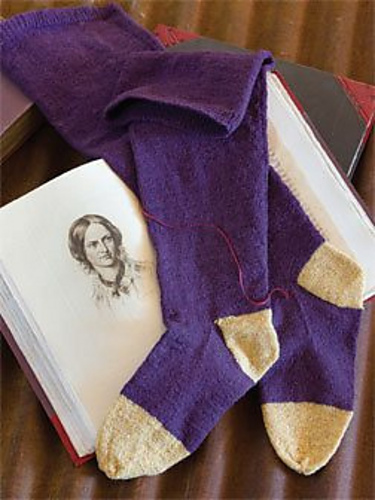 When I researched the York knitting manual writer, Elizabeth Jackson, I found she had many close family ties with Russia, and family members coming and going between Yorkshire and Russia – that was fairly typical of these female entrepreneurs/writers of the mid nineteenth century. It may be that the Schuberts also visited England and vice versa. This would explain the ‘German’ patterns and stitches that pop up in Cornelia and Mary’s work just as the ‘Russian’ ones in Jackson’s. By 1871, Charles and Cornelia had a “Berlin Wool Shop” at 8, Brook St, Westminster (Mayfair). Cornelia’s death was registered in Hackney – where her mother had been born – in the final quarter of 1875. For a while, I could find no further trace of Mary Austin – I reasoned that she could be one of the Mary Austins who died between the 1871 and 1881 censuses – without getting death certificates, it would be hard to know. A search on BMD yielded a lot of Mary Austins and no way of knowing for sure, which was our’s. She may also have been one of the Mary Austins who married during that time, I thought which would explain why she was elusive in the 1881 Census. And I nearly never found Cornelia’s obit, either, as I had run a search for ‘Cornelia Mee’ and come up with nothing. Only to have the idea to try “Mrs Mee” which promptly not only gave me Cornelia’s obit but mention of the fact Mary died in December, 1874, the year before her sister. Our obituary contains a notice of the death of Mrs Mee, a sister of Mr E.Austin of Clifton. She may be said to be the founder of the literature of the work-table now so popular. Forty years ago, when residing at Bath, she issued a ‘Manual of Needlework’, which rapidly passed through several editions, and is still a standard work. Subsequently, in conjunction with her sister, (Miss Austin who died in December last), she produced ‘The Work Table Magazine’ a profusely-illustrated serial, which had a successful career. This was followed by a series of books having special reference to some particular department of needlework, such as embroidery, lace, knitting, netting, crochet, &c., all of which had large sales , and some of which have passed through upwards of a dozen editions. So well was she known as a mistress of art that Thackeray refers to her by name in ‘Vanity Fair’, and some other of his novels. Up to almost the time of her death she was engaged on a work in which flowers, and their language were to be illustrated by various designs in needlework. Cornelia and Mary’s ‘Exercises In Knitting’ was published in 1846. I knitted the “For A Comforter” pattern (p.67, 1847 edition, here). The pattern casually mentions working in “double knitting”. 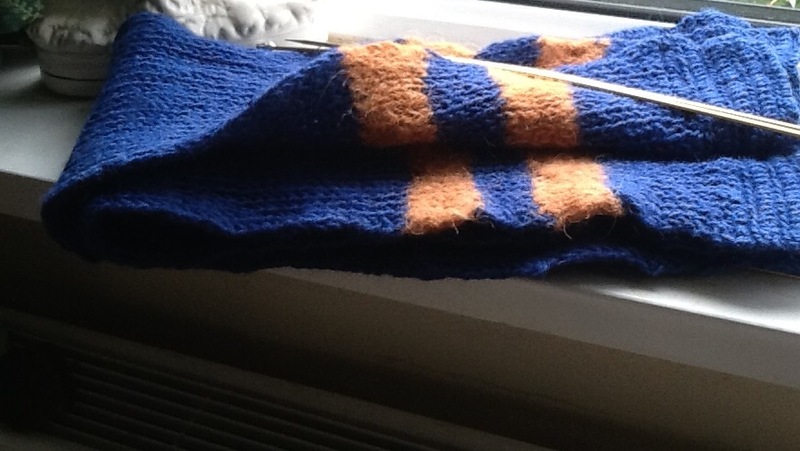 I guessed this was a stitch that appears to be stocking stitch on both sides but couldn’t immediately find much help online, as to how to do “double knitting”. When I did find instructions, for “Victorian double knitting” on a blog – they turned out to be completely incorrect. The Victorian knitting manuals weren’t much help, either; writers seemed to casually mention “double knitting” without ever describing how to do it. 1st row. Bring the wool forward, slip 1 the reverse way, pass the wool back, knit 1, passing the wool twice round the pin, repeat. 2nd row. Bring the wool forward, slip off the double stitch the reverse way, pass the wool back, knit 1, passing the wool twice round the pin, repeat. To knit your scarf, then simply repeat the “2nd row” for every row. On the final row, where you wound the yarn round double, just wind it round once so you end up with the same number of stitches you cast on. Another tip – work ends in as you go, by bringing them round to the front when you pass/drop the purl, then passing the tail to the back as you knit the knitted stitch. this will work the tail to the inside of the scarf. When slipping and dropping, you have the yarn in front. When knitting and making the new loop, you have the yarn in your normal working position for a knit stitch. I found this works brilliantly with Portuguese Knitting, as I can work both the knit and the slipped stitches with the yarn at the front of the work (orientated as I’d normally have it, when doing a knit stitch with this technique) – which made it ergonomic.But it’s easiest to work Victorian double knitting by using the knitting technique you prefer and use normally. I did a provisional cast on, to leave the scarf stitches live at the cast on edge, and then also left them live at the end. I then used “German Double Knitting” from Cornelia and Mary’s “Manual of Knitting” (1862 edition), for an edging; knitting it sideways and working the last stitch of every other row in with the live stitch of the scarf’s edge (K2tog), the same way you would with the edge of a Shetland shawl. 2nd row: ** P2 tog, YO, slip 1, repeat from ** to end of row. The first row is not repeated. The whole is done like the second row. When you have consumed all your scarf stitches, CO.
Jane Gaugain was possibly the first manual writer to develop abbreviations for knitting patterns – Jane’s shorthand, sadly, did not survive as it was a bit clunky; our contemporary abbreviations are more logical and intuitive than Jane’s inverted Ts, etc. Cornelia and Mary eschewed abbreviations and simply wrote instructions out in full. There are inaccuracies in some patterns, but generally where there is explanation, it is reasonably concise and clear. I found a mistake in the German Double Knitting but was quickly able to identify it, and adapt the pattern accordingly. The original scarf requires “four-thread fleecy” yarn, and is knitted in alternating stripes of geranium and grey, with one wider stripe at each end, then most stripes 12 rows deep. No 11 pins (3mm needles) are recommended. I’m not sure, but suspect four thread fleecy is some kind of 4 ply. ‘Fleecy’ sometimes referred to wool from a Leicester sheep as opposed to the imported German wools. The fabric produced is not going to be as well tensioned as your usual knitting – you have to try to be as consistent as possible when wrapping the yarn. Things will even out in the wash, as they usually do, with knitting, to some extent. I found myself wondering if Cornelia learned this from her mother – whether it was originally a German or English technique, or used in both countries? The knitted fabric is genuinely ‘double’ and its advantage for a scarf is that it will be warmer, as well as more stable and having the same appearance on both sides without the knitter having to cast on double the number of stitches and knit a tube. The number of stitches cast on is 48, but you should be counting 71 loops over the needle on each row, once you’re up and running. Don’t forget to reduce the stitches back to your original cast on row number, when on your last row, or your scarf will have different width ends. Also, as effectively you’re slipping and dropping stitches, it’s quite a fast knit. And definitely a technique I’ll use again when I need to knit a fabric that has a ‘stocking stitch’ appearance on both sides. 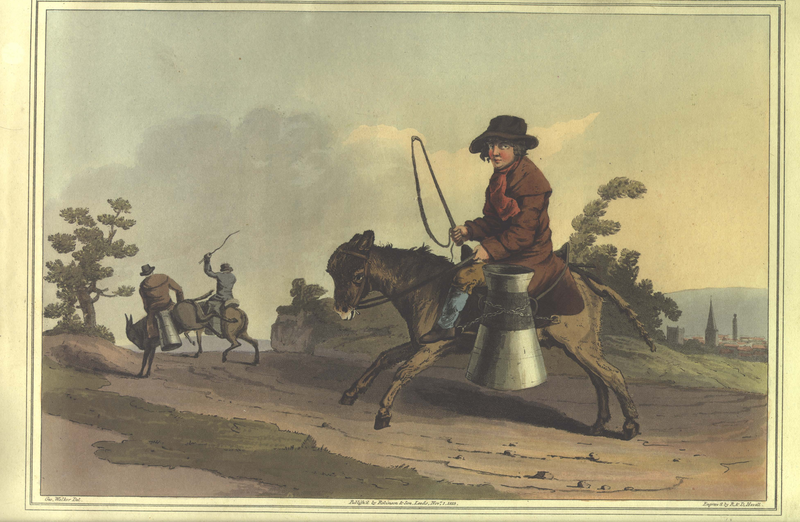 ‘The Milk Boy’, from George Walker’s ‘Costume of Yorkshire’, 1814. Image courtesy Yorkshire Ancestors. Earlier date but… spot the ‘comfortable’? This is by no means a complete bibliography – if you are aware of something I haven’t listed here, get in touch and I will add it. Many books have not been digitised; and some that have are not first editions, making it hard to track down the various imprints’ dates when date isn’t given on the title page. I’ve given the earliest edition I can find mention of online, where I’ve given a date. The Knitter’s Companion appears to be a series – certainly being actively published in the 1860s, possibly earlier. I can only find a couple of titles, though. A Manual of Knitting, Netting & Crochet Work, Cornelia Mee, 1842 (according to newspaper advert in The Bath Chronicle). The Knitter’s Companion, Cornelia Mee and Mary Austin, self published, into the 1860s. Seems to be a series of different books. One is titled “The Queen’s Winter Knitting Book, Series 3 of ‘The Knitter’s Companion'”, 1862.